2.4" Portable LCD Monitor... so you can hold your little one comfortably in the palm of your hand. Enjoy bright, crisp vision by day and night. Crystal Clear Night Vision... the clearest black and white picture let's you see every little move they make, even when it's lights out! Digital Zoom... use this super function when all you need is a closer look. Two-Way Talk... while you catch up on emails in the home office, sing your baby to sleep using the monitor's high-sensitivity microphone. Soothing Lullabies... classic pre-set lullabies will rock your baby to sleep in no time. 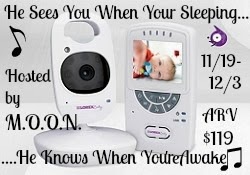 Built-In Nightlight... the wireless camera has a built-in nightlight to softly illuminate the room and help your baby relax into a sweet sleep. Crisp Sound... you won't miss a beat when you can tune in to every baby breath. 450 ft Outdoor Wireless Range... this feature ensures that your family is always in the comfort zone. Accommodates up to 4 Cameras... tots, toddlers and tweens. As your family grows, add three additional wireless cameras and keep an eye on everyone. Up to 8 Hours of Battery Life... with the power to go all day and all night, you will always have a reliable pair of eyes and ears in the nursery or playroom.